His Relations to the Jews. King of Persia; ascended the throne in 465 B.C., and died in 425 B.C. In the Persian name Artakhshathra ("he whose empire is perfected") the "thr" (written with a special sign in Persian) is pronounced with a hissing sound, and is therefore represented in other languages by a sibilant. Thus in Babylonian, Artakshatsu, Artakhshassu, and numerous variations; in Susic, Irtakshashsha; Egyptian, Artakhshasha; Hebrew, and (that is, Artakhshasta); in Greek, Αρταζήσσης (inscription in Tralles' "Corpus Inscriptionum Græearum," 2919), and by assimilation with the name Xerxes Αρταζήρζης and Αρτοζήρζης. According to the chronographic lists of the Babylonians and of the Ptolemaic Canon, Artaxerxes I. reigned forty-one years, which includes the short reign of his son Xerxes II., murdered after a reign of six weeks. Some Greek authorities give him only forty years; thus Diodorus, xi. 69, xii. 64. (Concerning the chronology, compare Meyer, "Forschungen zur Alten Geschichte," 1899, ii. 482.) From this period many dated archives are extant, found throughout Babylonia, but particularly in Nippur, by the expedition of the University of Pennsylvania (published by Hilprecht and Clay, "The Babylonian Expedition of the University of Pennsylvania," vol. ix., 1898). But there are no archeological remains of the reign of Artaxerxes I. with the exception of a single inscription on a building in Susa and an alabaster vase in Paris which bears his name in Persian, Susian, Babylonian cuneiform, and in hieroglyphs. All information concerning him is derived from the accounts of Greek writers, especially the fragments of Ctesias, and from the statements of the books of Ezra and Nehemiah. 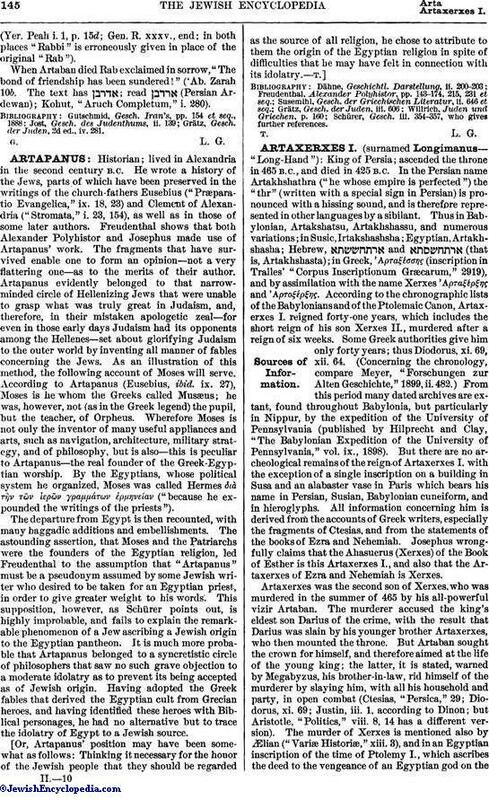 Josephus wrongfully claims that the Ahasuerus (Xerxes) of the Book of Esther is this Artaxerxes I., and also that the Artaxerxes of Ezra and Nehemiah is Xerxes. Artaxerxes was the second son of Xerxes, who was murdered in the summer of 465 by his all-powerful vizir Artaban. The murderer accused the king's eldest son Darius of the crime, with the result that Darius was slain by his younger brother Artaxerxes, who then mounted the throne. But Artaban sought the crown for himself, and therefore aimed at the life of the young king; the latter, it is stated, warned by Megabyzus, his brother-in-law, rid himself of the murderer by slaying him, with all his household and party, in open combat (Ctesias, "Persica," 29; Diodorus, xi. 69; Justin, iii. 1, according to Dinon; but Aristotle, "Politics," viii. 8, 14 has a different version). 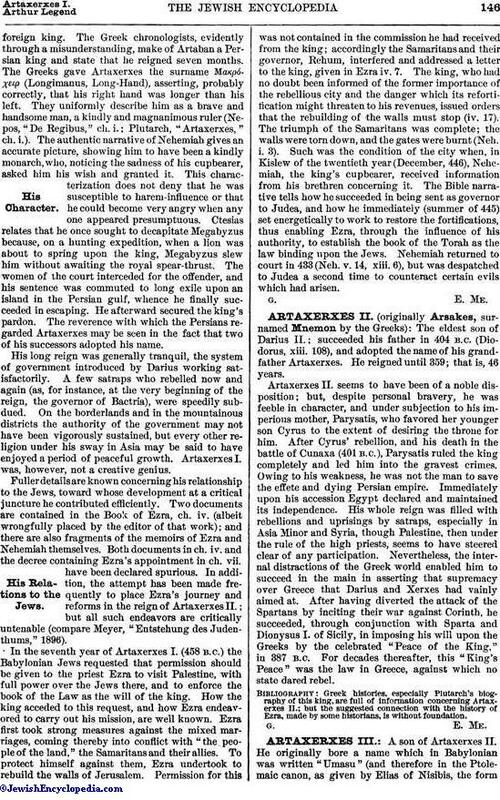 The murder of Xerxes is mentioned also by Ælian, ("Variæ Historiæ," xiii. 3), and in an Egyptian inscription of the time of Ptolemy I., which ascribes the deed to the vengeance of an Egyptian god on theforeign king. The Greek chronologists, evidently through a misunderstanding, make of Artaban a Persian king and state that he reigned seven months. The Greeks gave Artaxerxes the surname Μακρόχειρ (Longimanus, Long-Hand), asserting, probably correctly, that his right hand was longer than his left. They uniformly describe him as a brave and handsome man, a kindly and magnanimous ruler (Nepos, "De Regibus," ch. i.; Plutarch, "Artaxerxes," ch. i.). The authentic narrative of Nehemiah gives an accurate picture, showing him to have been a kindly monarch, who, noticing the sadness of his cupbearer, asked him his wish and granted it. This characterization does not deny that he was susceptible to harem-influence or that he could become very angry when any one appeared presumptuous. Ctesias relates that he once sought to decapitate Megabyzus because, on a hunting expedition, when a lion was about to spring upon the king, Megabyzus slew him without awaiting the royal spear-thrust. The women of the court interceded for the offender, and his sentence was commuted to long exile upon an island in the Persian gulf, whence he finally succeeded in escaping. He afterward secured the king's pardon. The reverence with which the Persians regarded Artaxerxes may be seen in the fact that two of his successors adopted his name. His long reign was generally tranquil, the system of government introduced by Darius working satisfactorily. A few satraps who rebelled now and again (as, for instance, at the very beginning of the reign, the governor of Bactria), were speedily subdued. On the borderlands and in the mountainous districts the authority of the government may not have been vigorously sustained, but every other religion under his sway in Asia may be said to have enjoyed a period of peaceful growth. Artaxerxes I. was, however, not a creative genius. Fuller details are known concerning his relationship to the Jews, toward whose development at a critical juncture he contributed efficiently. Two documents are contained in the Book of Ezra, ch. iv. (albeit wrongfully placed by the editor of that work); and there are also fragments of the memoirs of Ezra and Nehemiah themselves. Both documents in ch. iv. and the decree containing Ezra's appointment in ch. vii. have been declared spurious. In addition, the attempt has been made frequently to place Ezra's journey and reforms in the reign of Artaxerxes II. ; but all such endeavors are critically untenable (compare Meyer, "Entstehung des Judenthums," l896). In the seventh year of Artaxerxes I. (458 B.C.) the Babylonian Jews requested that permission should be given to the priest Ezra to visit Palestine, with full power over the Jews there, and to enforce the book of the Law as the will of the king. How the king acceded to this request, and how Ezra endeavored to carry out his mission, are well known. Ezra first took strong measures against the mixed marriages, coming thereby into conflict with "the people of the land," the Samaritans and their allies. To protect himself against them, Ezra undertook to rebuild the walls of Jerusalem. Permission for this was not contained in the commission he had received from the king; accordingly the Samaritans and their governor, Rehum, interfered and addressed a letter to the king, given in Ezra iv. 7. The king, who had no doubt been informed of the former importance of the rebellious city and the danger which its refortification might threaten to his revenues, issued orders that the rebuilding of the walls must stop (iv. 17). The triumph of the Samaritans was complete; the walls were torn down, and the gates were burnt (Neh. i. 3). Such was the condition of the city when, in Kislew of the twentieth year (December, 446), Nehemiah, the king's cupbearer, received information from his brethren concerning it. The Bible narrative tells how he succeeded in being sent as governor to Judea, and how he immediately (summer of 445) set energetically to work to restore the fortifications, thus enabling Ezra, through the influence of his authority, to establish the book of the Torah as the law binding upon the Jews. Nehemiah returned to court in 433 (Neh. v. 14, xiii. 6), but was despatched to Judea a second time to counteract certain evils which had arisen.